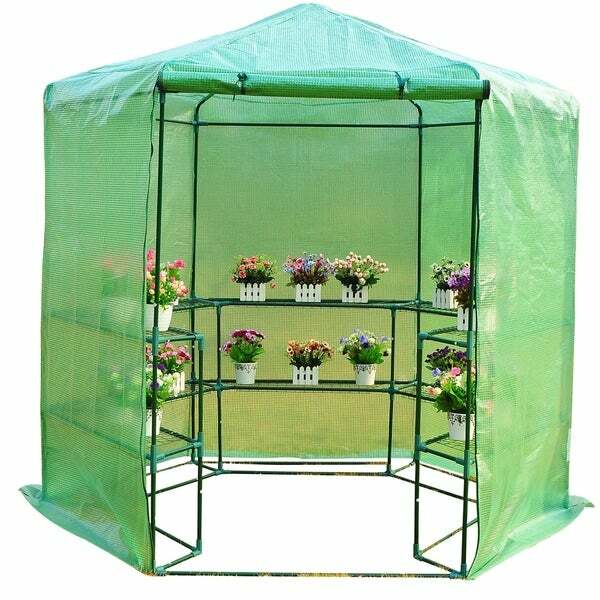 This open "walk in" portable greenhouse utilizes lightweight, yet sturdy, PVC coverings built over a powder-coated steel frame. The combination of these two elements is an incredibly durable final product that can be moved from location to location, fitting in tight spaces as available. The zipper door allows for easy access and ventilation while it also can be sealed in to maintain the internal climate. Perfect if you want to reduce excessive heat or cold and keep your seedlings safe throughout the seasons. The "three tiered" hexagonal design adds the shelves and shape that is perfect if you need storage internally and want to fit the greenhouse in specific areas. Start your backyard gardening today with this Outsunny greenhouse. Dimensions 76.0 In. X 76.0 In. X 88.0 In. The size and price are great & it's actually sort of cute put up (hence 3 stars), but it has leaks all over the top, which are small rivers now that the rain has come. While assembling, we noted a 3" seam spot over the door that was mis-sewn, making a hole right on the seam line. We taped that, thinking it was a minor flaw, but there are at least 3 other serious leak points; covering with a tarp will block the natural light & be an ugly mess; the alternative is to allow cold rain to drip down my plants and right into plant pots, over-watering them. I won't buy another greenhouse unless it's local so I could pack up the huge box and return it for a better one. I do like it in concept, but really wish it were better made. Now that I've reviewed, I'm off to get soaked trying to figure out how to save my plants! It is setup perfect to have starter plants in it. Ordered this green house hoping it will serve it’s purpose for one season but I was pleasantly surprised by it’s quality. It survived the worst windy spring we had in California for a while. It’s packed now and we will use it next spring again. It was very easy to assemble. This product will not stay together unless you drill each fitting and add sheet metal screws to hold it together. I used 118 6 x 1/2 Pan Phillips Sheet Metal Screws to stabilize the frame. The shipping was very quick, but sad to say the product was not what I expected. No directions and flimsy. The covering is a thick plastic which is not what I was looking for. "Hi, can you tell me how wide each side is and the width of the shelves? I'm trying to figure out if it would fit over one of my 4' x 4' raised garden beds. Thank you." No side is 4ft on its own and the shelves ARE the sides: they're the scaffolding that holds the thing up, so you have to use them. (There are wire inserts that drop in place to make the 'shelves,' so you also can't place things right up against the walls... now that I've measured, this makes the usable floor space approx 64" from the door to back wall, but less than 4'5" on all other sides. You may well be able to use it, but I'd be remiss if I didn't mention mine hasn't turned out to be leakproof at all (but I'm in Oregon, and it could be just my one item). Hope this helps.